It’s getting colder and colder in Tokyo, we are going to need heaters soon. 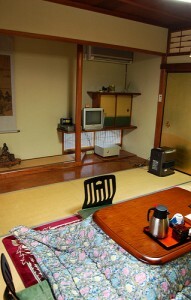 Many Japanese households have kotatsu, which is traditional heater table with futon blanket. There is an electric heater underside of a table board, which keep your legs warm. It is placed on tatami or carpet. The kotatsu placed over a square hole in a floor is called horigotatsu, with that, you don’t have to fold your legs, and you can sit like sitting on a chair. During winter, kotatsu is used as an all purpose table; family naturally gets together around kotatsu, and they eat, watch TV, and play cards. 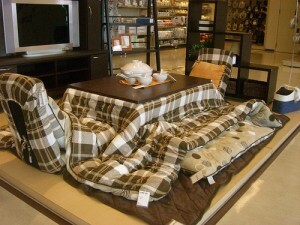 Kotatsu is a low table, but recently there are high table kotatsu and kotatsu desk are sold too.